Galaxy Note FE Pricing, Specifications Appears on Korean Site - Playfuldroid! Samsung is heavily pegged to launch the refurbished Galaxy Note 7 at the end of this month. Recent information has revealed that it will be launching as Galaxy Note FE (Fandom Edition). The refurbished phablet has been founded listed on a Korean retailer site with its full specifications and pricing. The Galaxy Note FE listing shows that its specifications is same as that of the original Note 7. However, the only difference is that Note FE has a smaller 3,200mAh battery whereas the Samsung Galaxy Note 7 came with a larger battery of 3,5000mAh capacity. Previous speculations had revealed that the Note FE would be arriving preinstalled with Android Nougat OS. However, the listing of Note FE on the Korean site states that it is loaded with Android Marshmallow OS. The listing shows three different carrier variants of Samsung Galaxy Note FE that are aimed towards South Korean operators like SKT, KT, and LG U+. 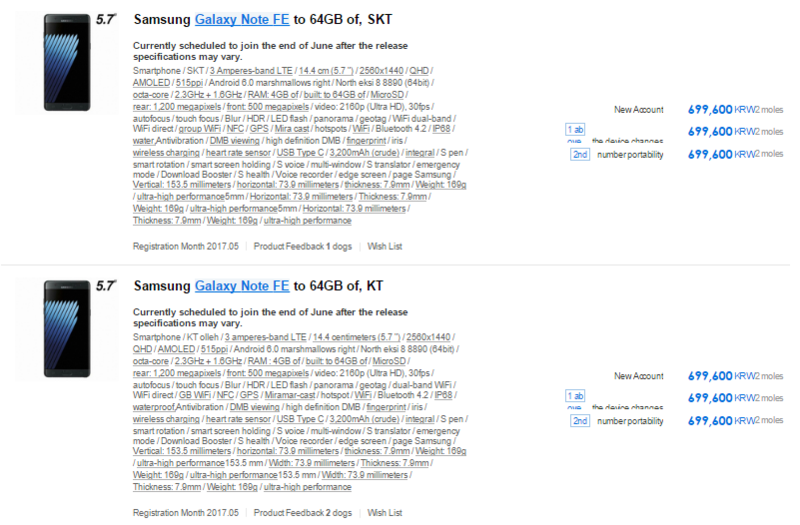 Initial Galaxy Note FE rumors stated that it will be launching with a pricing of 700,000 KRW (~625). However, the listing of Note FE on Korean retailer shows that it is priced at 699,600 KRW ($625).